As a trainer I often find that there are some very useful tools in the Microsoft Applications that are unknown to users. One of those features is Custom Shows in PowerPoint. Let me tell you how they can help you when you are creating and using presentations. Imagine that you need to present your ‘New Products’ presentation to three different clients. Instead of you having to triplicate the presentation and editing each copy, you can use the Custom Shows facility. But What Are Custom Shows And How They Work? Custom Shows are tailor-made mini presentations within that same main presentation. Custom Shows allow you to adapt a single presentation to a variety of audiences, in the previous scenario your three clients. There are two kinds of Custom Shows: Basic and Hyperlinked. A basic Custom Show is a separate presentation that includes some of the slides of the original. Use a basic Custom Show to give personalised presentations to different clients using the same presentation file. For example, if your presentation contains a total of 10 slides, you can create a Custom Show named “Client A” that includes just slides 1, 2, 3 and 4. You can create a second presentation named “Client B” that includes slides 5, 6 and 7, and then you can create the third presentation named “Client C” that includes the rest of the slides in your presentation, slides 8, 9 and 10. When you create a Custom Shows from a presentation, you can always run the entire presentation in its original sequential order. You can use hyperlinked custom shows to organise content in a presentation. Going back to the New Products presentation, let’s assume that on slide 1 we have an overview of the company. You can then create a custom show for each new product and link these shows to slide 1 which has general information about the company. 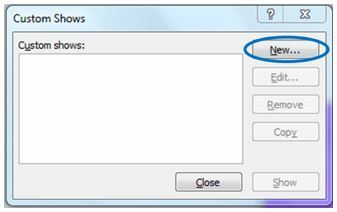 This will ensure that PowerPoint will return to slide number 1 once the custom show has been displayed. 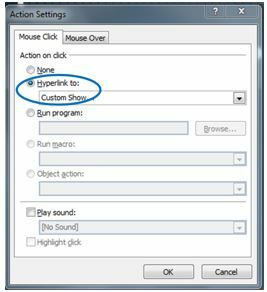 To create a hyperlink from the main show to a supporting show, in your presentation select the text or object that you want to represent the hyperlink, in our example in slide 1. 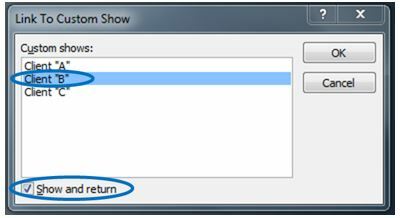 In the Link to Custom Show dialog box, select the custom show you want to want to go to, and then the Show and Return check box. We run a wide range of courses in Microsoft PowerPoint for beginners or more advanced learners. Take a peek at our PowerPoint courses where you can learn about all the different features, tips and tricks.